If you've ever looked at the moonless night sky from a spot where the air is clear and city lights are far away, you've seen the Milky Way  a band of stars so dense and so distant that they merge into a hazy ribbon of light. Astronomers have long known, however, that the Milky Way looks this way to us only because we're embedded inside it. What we're really looking at is an immense, flat pinwheel of stars and gases, spinning in a majestic whirl that takes Earth once around every 250 million years or so. We ride in an outer arm of that overall mass. 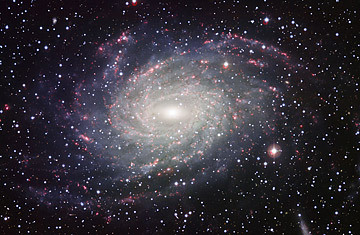 Thanks to painstaking measurements with optical and radio telescopes, astronomers have been able to figure out the structure and motion of our home galaxy with impressive precision, and have even been able to create reconstructions of what it might look like from afar. But what we've never been able to do is stand completely outside the Milky Way and look back at it. Now we can  sort of. The European Southern Observatory (ESO) has just released the best photo taken to date of NGC 6744, a galaxy located about 30 million light-years  or 280 million trillion km (170 million trillion miles)  away in the southern constellation Pavo (the Peacock). That's actually pretty nearby in cosmic terms, and of the galaxies in our immediate celestial neighborhood, NGC 6744 is probably the most similar to the Milky Way. The spiral arms, the elongated nucleus and the dusty halo are all the same. It even has a dwarf companion (the blob of faint light on the lower right) similar to the Magellanic Clouds that tag along beside our galaxy. Best of all, it happens to be tilted nearly face on from our point of view, so we can see its delicate spiral structure laid out in spectacular detail. Admittedly, NGC 6744 is about twice the diameter of the Milky Way, but that doesn't change the similarity in the architecture of the two. Indeed, the fact that it's supersize is actually a good thing. Viewed from Earth, NGC 6744 is about two-thirds the size of a full moon, but it's so faint you can't see it without a backyard telescope. Even then, you'd never guess what it really looks like. To get a sense of its true splendor, you need the power of a professional scope and the light-gathering prowess of an advanced electronic camera. Thanks to ESO's Wide Field Imager camera, bolted onto a 2.2-m (7.2 ft) scope at La Silla, in the high desert of northern Chile, we don't have to guess anymore. See "Rogue Planet: Billions of Jupiters on the Loose in the Milky Way." See the case for alien life.